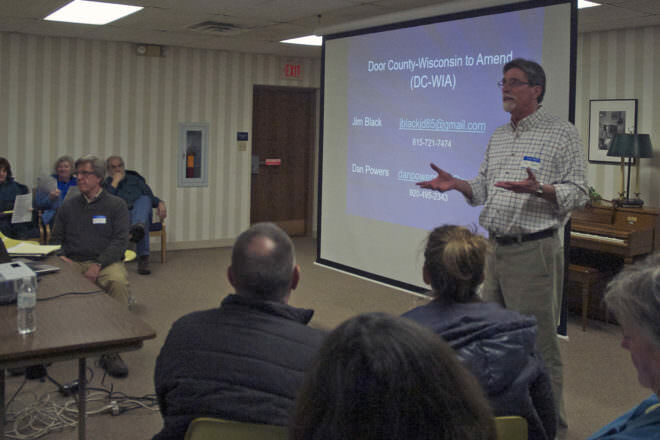 Dan Powers (standing) and Jim Black (seated at table) were the only members of a new organization called Door County-Wisconsin to Amend until their presentation to a packed room at the Sturgeon Bay Library on Jan. 31. Photo by Jim Lundstrom. In these politically divisive times, Dan Powers and Jim Black tread lightly in introducing their newly formed campaign finance reform group Door County – United to Amend at a packed public forum held at the Sturgeon Bay Library on Jan. 31. More than once during his presentation, Powers pointed out that the idea of a Constitutional amendment to limit dark money in political campaigns is a nonpartisan movement that is growing across the country. In fact, he pointed out, 18 states are already on board with referendums, resolutions or letters of support for a 28th Amendment to the U.S. Constitution. The pair called the meeting to introduce the idea of their organization – of which they were the only two members until Jan. 31 – to the county. Powers said 54 people signed the petition at the meeting and another 20 said they would be interested in getting involved. “We were thrilled with that,” Powers said. Powers, a retired teacher who lives in Sturgeon Bay, and Black, a Chicago lawyer who sold his practice and now lives in Sister Bay, met through their individual interest in campaign finance reform when they started investigating the state organization Wisconsin United to Amend. They then decided to band together and form an organization to get Door County on board with the idea of campaign finance reform. The problem: The controversial 2010 Citizens United decision by the U.S. Supreme Court and other rulings have said spending money on political campaigns is exercising free speech, and gave manmade entities (corporations, unions, etc.) the same constitutional rights as individuals. The Citizens United decision, Powers said, spawned super PACs and made it illegal to limit money super PACs provide to political candidates. The solution: An amendment to return Constitutional rights to human beings only. There are two ways an amendment can happen, either with a two-thirds majority vote in both the House and Senate, or by a constitutional convention called for by two-thirds of the state legislatures. None of the 27 Constitutional amendments have come about through constitutional convention. A proposed amendment becomes a piece of the Constitution when it is ratified by three-fourths (or 38) of the states. Powers showed a graph that illustrated the tremendous rise in dark money since the 2010 Citizens United decision, and also pointed out that many groups have formed in opposition to the Supreme Court decision. “The amendment proposed is the only effective and permanent way to overturn Citizens United,” he said. He explained that this is a grassroots movement that he and Black want to recruit others to in other communities throughout the county so they can bring the issue to their municipalities. They want to see local communities get behind the movement by passing resolutions, and then bringing it to the county level, and then eventually to the state. He said 95 Wisconsin communities have already supported the movement, with 19 of those joining in the last election, and all of those passed in the high 70- to 80-percent majorities. Powers said both he and Black have talked with municipal leaders in their respective communities about passing a resolution in support of a Constitutional amendment, and they were looking for others to bring the issue before their town and village boards. “This is going to be a long-term dialogue with a lot of people,” Powers said. 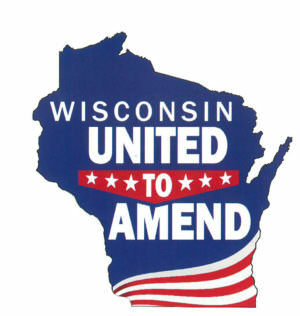 For more information on Door County – United to Amend, contact Powers at [email protected] or Black at [email protected]. * Connecticut, Maryland, Delaware and New York law does not allow the passage of a resolution; therefore, a majority of the legislators signed a letter.